Quantified Self is nothing new. We have been stepping on weightscales and been measuring our height for ages now. Doctors have been measuring our heart rates and blood pressures for decades. However “the Quantified Self movement” is something new. The main reason for this movement is the development of technology. With new technology self-measuring has become way easier, we suddenly have devices that can quantify our activity, sleep and many other relevant things. Furthermore the existing devices have become much cheaper, blood pressure monitors for example are not only for doctors anymore. Quantified Self is now available for the general public. Okay, Quantified Self is available for the general public, but what does it do? Quantified Self does not do anything, if you don’t do anything with the data you collect. If you collect relevant data, the data can aid you in multiple ways. However, the applications are broad. Self quantification can be used as a tool for self improvement, with QS experiments you can do your own personal research, and you can track yourself to remember (Lifelogging). And lastly, you can obtain a lot of knowledge from your own personal data. I will discuss these subjects seperately. The first beautiful thing what you, or your devices do is that you are able to receive relevant information about yourself (from your activity tracker for example). The application on your smartphone or your wearable can give you exact quantities of your behavior, therefore it easy to reflect on your own behavior. You start to evaluate your own activity behavior and compare it to the norm (for example 10.000 steps a days). Well, if you’re not active enough we would assume that this would trigger change within yourself. No external parties are involved, it is just your activity tracker which states some facts. Therefore this whole process is done very autonomously (this is very important for behavior change). The next steps are searching for options and formulating a plan. Even though you make very slow progress towards your goal (10.000 steps), with an activity tracker you can see little progress even if you add 100 steps every day, you will get there on your own pace. You can find an example in the next figure; from 5 October till 13 November I was losing weight. This was in little slow steps, these little steps are hard to notice if you don’t quantify your progress. but very satisfying to see in a graph. If you want to achieve something, it is way easier to achieve it with small baby steps. If you want to achieve too much right away the chances are high you will fail. This will demotivate you. If you make small steps, you earn little successes and therefore you become more confident. Figure 1. Body weight in kilo’s over time as measured with the Withings WS-30 scale. The second beauty about Quantified Self is denying everything, denying science, denying you mom’s advice, you have your own body in your hands. You can do stuff to yourself that science can’t. Talk about ethically unsound experiments or scientifically unmanageable experiments. Even though I am scientifically schooled and I believe in science, it is important to know that science doesn’t tell everything about you. Science always makes conclusions in general, never person specific. With Quantified Self you can figure out yourself if fruits really make you healthy. Have you ever thought about that? Also scientifically spoken, doing experiments at home and not at a research laboratory replicates real life situations much better. Sleep studies are mostly done in sleep laboratory however sleep analyzing at home is much more relevant. In general science you can often collect a few data points from your participants. You can measure someone’s sleep for a night or two, or let someone walk with a heart rate monitor for 24 hours. But you will never be able to monitor someone’s heart rate 24/7 for two years straight and compare this data with his sleep scores. Quantified self gives you this opportunity. You can investigate things that no one has ever done before. Looking at your history through your personal data is called lifelogging. Lifelogging is a form of quantified self. Lifelogging is tracking yourself just to see how active you were, where you have been, and how you have changed. This is not for the changing itself. You can see this form of self quantification as a personal diary, but than with digital data. With this data you can see yourself along the days, months, or even years. An example of this in the next figure; the picture shows a map of the places where I visited in my city. It seems that I don’t know my city that well, huh? Figure 2. A map of my city indicates where I have been the past year. Circles indicate specific places that I visited. 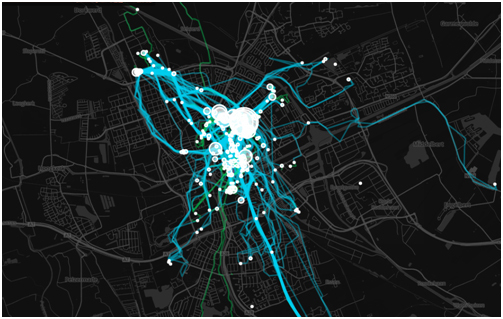 Activity is monitored with the Moves app, mapped with Move-O-Scope. Most of my QS experiments work different than normal science experiments do. From tracking to knowledge is a path I often take. I have the following example to explain this process; one day I was feeling unhealthy. So I quantified how healthy I felt; I scored below average for a while. That triggered me to change. I wanted to feel better! I had to make a plan to become healthy. Therefore I searched the internet and find that fruits should make me healthy. But will they really make me healthy? The first things I should consider to quantify are two things: Fruit intake, and Perceived health. Instantly, I got triggered to be aware of how many fruits I consume. So I decided to split my fruit consumption in two weeks, one week I eat a lot of fruits, and the second week I eat none fruits. But what kind of fruits should I eat that week? Are there “best” fruits, or should I vary in the sorts of fruit I eat? I also started to consider other things that should make me healthy, what about vegetables? What about meats? Should I control for that? The outcomes of the experiments are not always the strongest lesson, it is more about the process of self tracking that makes me curious and aware of my life. New questions arise to a curious mind. new experiments are formed, new answers are found. New questions arise. what is quantified Self? what is quantified Self? what is quantified Self? what is quantified Self? what is quantified Self? what is quantified Self? what is quantified Self? what is quantified Self? what is quantified Self? what is quantified Self? what is quantified Self? what is quantified Self? what is quantified Self? what is quantified Self? what is quantified Self? what is quantified Self? what is quantified Self? what is quantified Self? what is quantified Self? what is quantified Self? what is quantified Self? what is quantified Self? what is quantified Self? what is quantified Self? what is quantified Self? what is quantified Self? what is quantified Self? what is quantified Self? what is quantified Self? what is quantified Self? what is quantified Self? what is quantified Self? what is quantified Self? what is quantified Self? what is quantified Self? what is quantified Self? what is quantified Self? what is quantified Self? what is quantified Self? what is quantified Self? what is quantified Self? what is quantified Self? what is quantified Self? what is quantified Self? what is quantified Self? what is quantified Self? what is quantified Self? what is quantified Self? what is quantified Self? what is quantified Self? what is quantified Self? what is quantified Self? what is quantified Self? what is quantified Self? what is quantified Self? what is quantified Self? what is quantified Self? what is quantified Self? what is quantified Self? what is quantified Self?